Big weed is throwing some of its new money into politics. 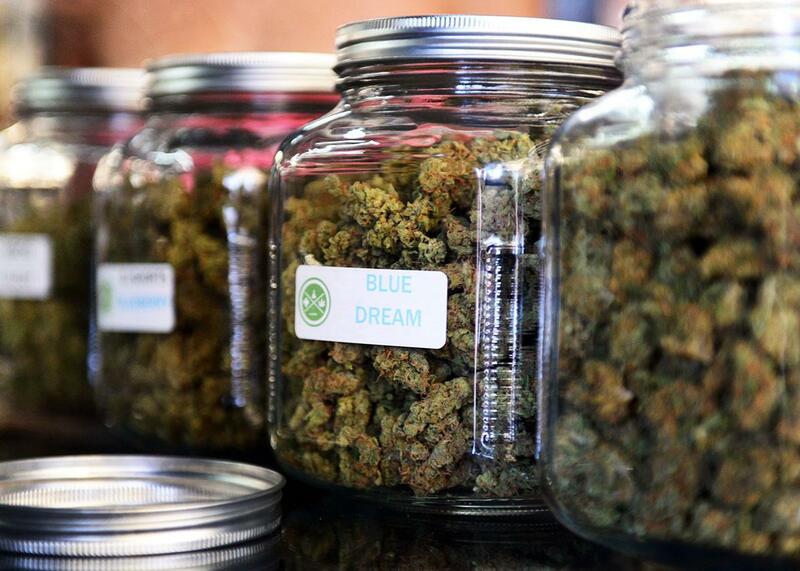 The highly rated strain of medical marijuana Blue Dream is displayed among others in glass jars at Los Angeles’ first-ever cannabis farmers market on July 4, 2014. When Secretary of State Michele Reagan put her stamp of approval on petitions bearing 177,000 signatures in Phoenix on Thursday, Arizona became the fifth state to schedule a ballot measure for November on legalizing recreational marijuana—joining California, Maine, Massachusetts, and Nevada. Each of the measures calls for making it legal for people older than 21 to possess small amounts of pot, taxing the drug and allowing regulated stores to sell it. Arkansas, Florida, and North Dakota will vote this fall on legalizing medical marijuana. And Oklahoma may yet join the fray. The activity is a sign of just how much momentum the movement has picked up in only a few years. In 2012, Colorado and Washington became the first states to pass ballot measures making the sale and use of pot legal. Alaska, Oregon, and the District of Columbia followed in 2014. Twenty-five states and D.C. have medical marijuana laws, and others have decriminalized small amounts of the drug. As the movement has grown, the politics behind marijuana are also undergoing a subtle shift. Though traditional pro-pot activists have given the bulk of the money supporting the five recreational pot ballot measure campaigns—roughly $7 million of the $11.6 million raised so far—more and more of the backers are coming from the new but growing marijuana industry. Two-thirds of the big donors—those giving at least $5,000 to the campaigns for this fall’s measures—have direct financial stakes in the weed business, according to a Center for Public Integrity analysis of state records. Indeed, as legalized pot grows in state after state, so has the industrial complex around it. This year, though, marks the first time this new legal pot industry has significantly contributed to making itself bigger. Now the movement’s campaigns are starting to resemble most other big-money ballot measure fights, with business-minded donors looking to protect or enhance their profits. In Nevada, for example, at least 39 out of 47 major donors—who gave at least $5,000 each to the campaign supporting legal weed—have financial interests in expanding the legal marijuana market. They contributed $625,000 of the more than $1 million that the pro-pot political committee has raised so far. Among them: more than a dozen existing medical marijuana dispensaries and five beer distributors, which would have the first shot at being the state’s recreational pot dispensaries and distributors, respectively. Similarly, in Arizona, where a pending court case could complicate marijuana advocates’ path to the ballot, at least 26 of the 35 top donors potentially stand to make a profit if recreational marijuana is legalized there. The campaign so far has raised $2.2 million. In Massachusetts, 11 out of 18 major donors came from the marijuana industry, though they accounted for only $80,000 of the nearly $500,000 supporters raised. In contrast, only two of the 17 major donors to the measure that legalized weed in Colorado in 2012 had ties to the marijuana industry. They raised just $42,000 of the $3.3 million total raised by supporters. In other states voting this year, the funding is more of a mixed bag. In California, where campaign supporters have raised more than $7.1 million, Napster and Facebook investor Sean Parker has bankrolled the campaign to the tune of $1.5 million. But Weedmaps, a company that helps customers locate pot shops, contributed $1 million. The Werc Shop, a laboratory that tests marijuana for potency and pesticides, pitched in $5,000, as did several other weed-related businesses. Jeffrey Raber, a California chemist who founded the Werc Shop, acknowledged his company would benefit from the measure’s passage, since it requires legal marijuana to be tested at facilities like his. But he and his clients mostly want the state to regulate their business so they can “be recognized as responsible citizens who are legitimate actors,” he said. In Maine, only one of the major pro-marijuana contributors is closely related to the pot industry. The initiative there is in part led by a group representing small marijuana farms, which has donated $10,000 of the $692,000 raised by the committees supporting the measure. Those interested in legalizing marijuana are trying to adjust to the new funding dynamics. Twenty-six states allow residents to put measures on the ballot. The efforts are notoriously expensive, often requiring generous donors to pay workers to gather enough signatures to allow the measures to go before voters and then promote them with pricey ads. So major ballot measure fights are often dominated by corporations spending to support or block measures that would affect their bottom lines. The Marijuana Policy Project, a nonprofit known for its major influence in making marijuana legal in Colorado and Alaska, acknowledges that the industry is more involved in bankrolling the political movement now—and sees potential for even more funding. Others are dismayed at the legalization movement’s new corporate friends. Dan Riffle quit his job as a lobbyist at the Marijuana Policy Project because he said he was uncomfortable with how closely tied the advocacy group had become to industry. Some longtime marijuana activists breathed a sigh of relief when an investor-backed marijuana measure in Ohio failed last year. The measure would have given the right to farm pot for profit exclusively to the investors who paid for the campaign. Some, like the Drug Policy Alliance’s executive director Ethan Nadelmann, worry that the same kind of entrepreneurial mindset will drive the future of legalization. But some industry donors say they’re not solely motivated by dollar signs. Steve White, whose company owns marijuana dispensaries in Arizona and other states, said he gave more than $54,000 to the Arizona measure because he believes it will help medical users of marijuana avoid unfair prosecution, among other reasons.